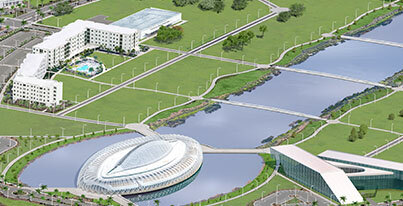 The Florida Polytechnic University Health Clinic is located inside the Wellness Center and offers a variety of healthcare services. The Health Clinic is provided by Lakeland Regional Health and is staffed by a Registered Nurse. 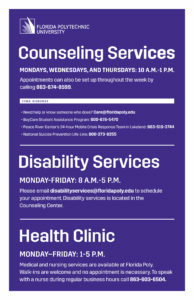 Students can stop by the clinic for general medical services addressing acute conditions, minor illnesses and injuries. The Clinic can also provide referrals to local health care providers and specialists as needed. Please remember that any chronic or major medical conditions should be treated by the student’s regular doctor. If a serious and urgent health problem arises, a student should dial 9-1-1 or visit the Lakeland Regional Medical Center Emergency Room or nearest hospital. Walk-ins are welcome and no appointment is necessary. If you are in need of urgent medical or mental health care, please dial 9-1-1 at any time of the day or night or visit Lakeland Regional Medical Center’s emergency room or your nearest hospital.